University of Maiduguri (UNIMAID) Postgraduate School Admission Form, Available Courses/Programmes, Admission Requirements and Online Application Guidelines and Procedures for 2018/2019 Academic Session. Applications are invited from suitably qualified candidates for admission into the University of Maiduguri (UNIMAID) School of Postgraduate Studies / Programmes for the 2018/2019 academic session. 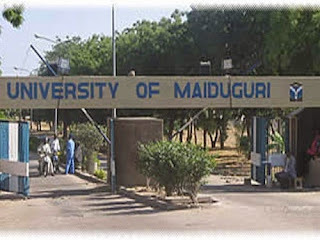 For list of available programmes and admission requirements of the University of Maiduguri (UNIMAID) School of Postgraduate Studies Click here to download in PDF. Forms are obtainable at the School of Postgraduate Studies, University of Maiduguri after paying a non-refundable fee of N15,000 at UNIMAID Microfinance Bank.